As memories of Japan fade, this week sees the last of my collection of miniatures I picked up when visiting the Yamazaki distillery last year. This is Suntory Royal, a blended whisky that seems to have a varied past. 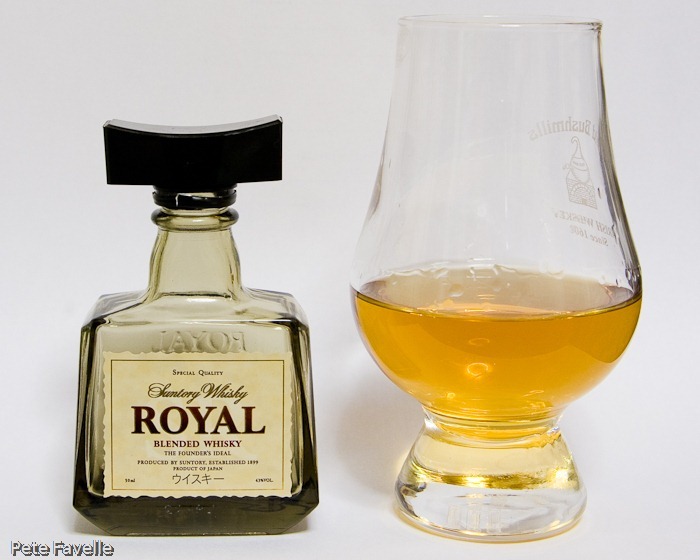 I’ve come across mentions of Royal bottlings with age statements ranging from 12 to 60 years, but this one has no age on it. The nose is typically Suntory – sweet brown sugar and a clean alcohol hit, with just a hint of tangerines underneath. Watered, the sweetness and alcohol is reduced allowing for other aromas to become apparent – wet wood, and orange blossom. The first thing to hit the tip of your tongue is sugar, followed by a growing alcohol heat which slowly lets the raw grain shine through. There’s a slight edge of bitterness, but it’s smooth and almost creamy in the mouth. With water, it’s still sugar sweet but the alcohol heat is reduced. The raw grain character, too, is less pronounced and there’s a fresh, faintly citrus fruit tone. With the tempered alcohol, it becomes a very drinkable dram. 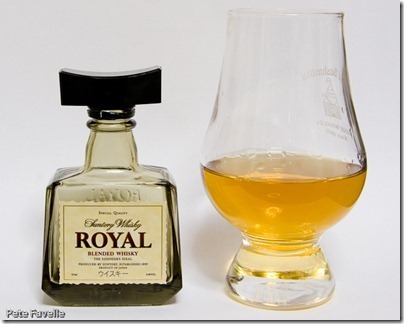 Despite my instinctive prejudice against ageless and blended whisky, Suntory Royal is actually a pretty decent one – it’s not deeply complex, but it’s tasty and easy drinking and I happily give it 3 stars.